American elm, also referred to as white elm, is a tall tree (up to 80 feet). When growing in the open, the trunk divides near the base into several large limbs which arch outward, resulting in an attractive, vase-shaped silhouette. 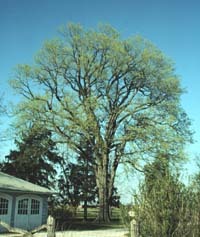 American elm occurs on moist upland sites and bottomlands. In bottomlands, the trunk is more likely to be buttressed than in the uplands. American elm was widely planted as an ornamental in urban settings because it was stress-tolerant, fast growing, and beautiful. When planted along city streets, the over-arching branches created a cathedral-like effect. Unfortunately, both urban and forest populations of American elm were devastated by Dutch elm disease, which entered the country from Europe on shipments of logs in approximately 1930. Dutch elm disease is caused by an Asian fungus, which is spread from tree to tree via North American and European elm bark beetles (Scolytus multistriatus). The disease spread westward across the U.S from several centers in the east, and continues to be a problem today. American elms once lived to be 200 or more years old. Since the spread of Dutch elm disease, individuals rarely survive beyond 30 years. Scientists are trying to propagate the rare individuals that are susceptible but naturally tolerant to Dutch elm disease. This effort offers hope for sustainable elm populations in the future. The bark is light or dark gray and furrowed. The leaves of American elm are alternate, simple, and have doubly toothed margins. They are oval to elliptic and are 4 to 6 inches long. The surface of the leave is smooth (sometimes sand-papery), dark green and feather-veined. The underside is pale green. The flowers (also link to herbarium sheet) appear before leaf-out in late winter or early spring as drooping, hairy, greenish-red clusters of 3 to 4 flowers. The fruits are oval and flat, up to 1/2 inch long, and have papery wings, and are eaten by a variety of birds including bobwhite, prairie chicken, ruffed grouse, and songbirds. Opossum and squirrels also eat the fruits. The inner bark is tough and can be twisted into fibers and made into a rope. The wood is heavy and strong and is used in flooring. It was used in shipbuilding and for farm implements, as well. Native Americans used various parts of elm for the treatment of numerous ailments and diseases ranging from broken bones and gunshot wounds to diarrhea and coughs.